Lexington Farm First Massachusetts Entry in Soil Carbon Challenge | Planet-TECH Associates: Trends. Innovations. Opportunities. Challenge co-founder says: “Occupy the carbon cycle!" Meadow Mist Farm in Lexington is the first Massachusetts entry in the Soil Carbon Challenge, an international competition to measure how quickly land managers can turn atmospheric carbon into soil organic matter, essentially reversing climate change. Peter Donovan, of the Soil Carbon Coalition, a non-profit agency overseeing the Challenge, was in the Boston area for two days on November 11 and 12 to give presentations and to take soil samples at the Meadow Mist Farm. According to Donovan, the samples, taken at three different depths, will be sent to labs where the carbon is measured in order to establish a baseline profile. These profiles are then posted on the web, creating a high standard of transparency. The Challenge is a ten-year competition with followup profiles taken periodically. John Moriary of the Meadow Mist Farm says, “When this test is repeated in another five years or ten years, it will be a good indicator of the health of the soil, and will help us learn what kinds of practices could have contributed to soils getting better or worse overtime”. Mr. Donovan is traveling across the country recruiting land managers to participate in the Challenge, demonstrating how to take the samples. 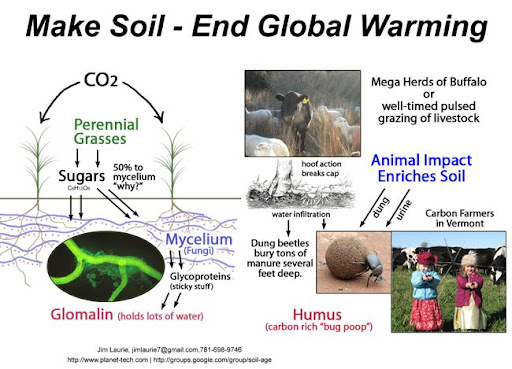 According to Donovan, our greatest hope in breaking the cycle of global warming and groundwater evaporation, is to get more carbon into the soil. He stated, “The only way to ameliorate this vicious cycle, is to get more carbon into the soil, because water will follow." The Planet-TECH News Wire brings notices of events, trends, and innovations which hold promise for a regenerative future. It is a service of Planet-TECH Associates. More information at www.planet-tech.com.